We’ve written a lot about sensory issues over the years. 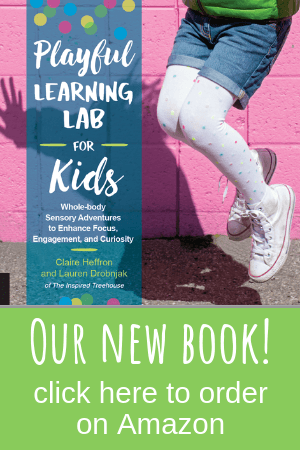 We’ve covered everything from sensory strategies and sensory tips to sensory activities and more! We even wrote a book called Sensory Processing 101! Our readers tell us that all of this information is really helpful, except for one catch…eventually little kids with sensory needs grow into big kids with sensory needs. How do kids’ sensory needs change over time and how can we adapt our approaches to accommodate for these changes? Great questions, right? Enter our new friend Courtney Dickinson. With over 14 years of experience as a pediatric occupational therapist, Courtney has a strong background in sensory integration. She is a Sensory Integration and Praxis Test (SIPT) certified therapist and typically has at least one teen on her caseload at all times. We’ve asked Courtney to join us as a contributor here at The Inspired Treehouse to create an entire series full of tips, tricks, and strategies to help support teens and older children with sensory issues. So without further ado…here’s Courtney! Thank you to The Inspired Treehouse for having me! My name is Courtney Dickinson and I have been working as a pediatric OT for the past 14 years. My area of specialty is in working with children with sensory processing needs. I know I tend to have my own “tool box” that I go to when creating sensory diets and sensory strategies for the kiddos I am working with. Often these strategies in this “toolbox” are not appropriate for my teens and older kids. 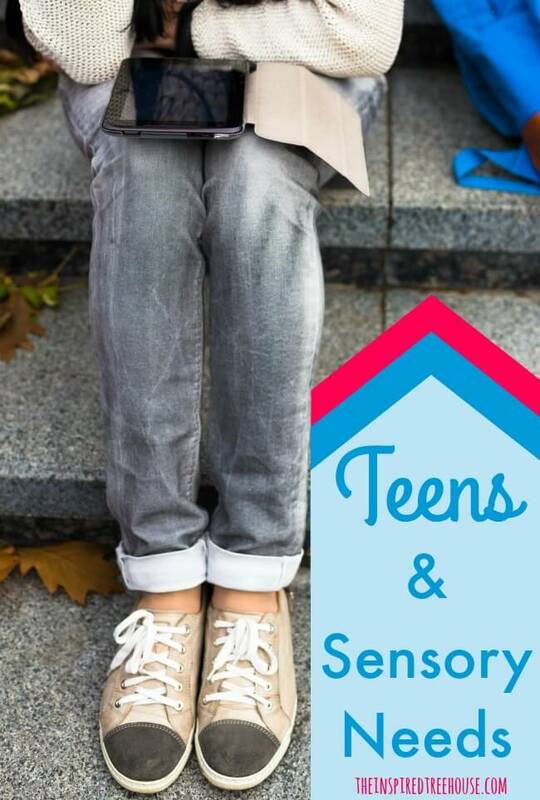 When coming up with a sensory diet and/or sensory strategies for teens, it is important to take into consideration their specific interests as well as their individual sensory profile. Teens do not want to stand out from their peers so it is most important with this age group to figure out how to fit sensory strategies into their daily activities and make these strategies part of everyday life. It can be difficult to get teens to cooperate, so making it as appealing to their individual interests as possible is essential! Many children with sensory processing needs struggle with social interactions with their peers. The environment and the individuals in the environment can be unpredictable, which is not typically a good thing when someone is experiencing sensory processing difficulties! -Try engaging your teen in a game of charades where they need to act out different emotions/feelings. Many teens struggle with reading nonverbal social cues and this can be a big hindrance to social interactions. -Make mini movies by acting out different social scenarios (i.e. inviting a friend over to your house to hang-out, introducing yourself to a new kid at school, etc.). -If your teen enjoys drawing, draw out cartoons with different social scenarios. -Look into Asperger’s Experts on YouTube; they are 2 males with Asperger’s diagnoses that talk about strategies that have worked for them and it may help your teen to be able to see others who are facing similar challenges. -Create a positive comment jar where everyone in the house or classroom writes 1 nice thing about someone else. At the end of the week, read all of the comments out loud (this helps teach your teen both how to give compliments and how to receive them). -Anything video game or technology-related! I am not particularly tech-savvy so I prefer to stay away from this, but often it is not possible with this age group. Teens could work toward earning extra screen time each weekend for participating in sensory strategies during the week. Try apps or websites with yoga or other workouts that incorporate needed sensory input. -Use charts to track and show progress. Posting a chart that shows an increase in repetitions of specific activities each day/week helps teens see that they are making progress and gives a “why” to what they are doing. -Have teens help create goals they would like to accomplish such as lifting a certain amount of weight, trying out for a sports team, or running in a race. Create steps and timelines for achieving these goals. -Make strategies fit into everyday life routines such as: exercise/weight lifting for heavy work and proprioceptive input, taking a shower every morning before school to help alert and engage, or providing crunchy snacks/meals to increase arousal or chewy snacks for regulating input. -Giving teens specific chores to meet sensory needs. For example: Vacuuming is heavy work, washing dishes provides tactile feedback, and cooking can provide input to multiple systems. -Incorporate competition! For some reason, teens seem to be more cooperative when they are in some type of competition (i.e. Who can do the most push-ups in 1 minute? Who can hold the plank the longest?). This is a great way to increase participation in exercise and other sensory activities. -Provide teens with a safe space to exercise and work out; set up a small space where they can do this privately. -Have teens help pick out personal items that they can try/smell such as lotions, shampoos, soaps and deodorants, etc. -Use of tight, lycra clothing tends to help with regulation. Girls may like tight camis under their shirts and boys may like Under Armour gear or other lycra shirts that could be worn under their typical clothes. 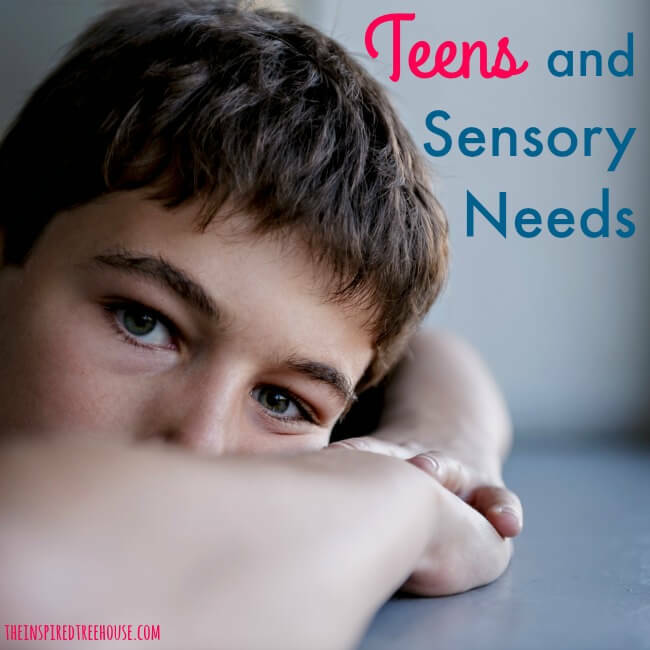 -Have your teen help you organize a sensory space where they can get needed input. This will vary depending on your teen’s needs but could be a space with a beanbag chair, some stress balls, a pack of gum or beef jerky, headphones with music, and an eye mask (all tend to be good for sensory-sensitive kids). Or it may be a space with a trampoline, music, strobe lights and tennis balls they can throw against wall and catch (all great for sensory-seekers). -Add small weights to a backpack to provide heavy work (do not exceed 10-15% of body weight). -Use essential oils to promote calm and relaxed behavior (some examples include using peppermint or basil to improve concentration and using lavender or cedarwood to promote relaxation). -Etsy sells a variety of typical-looking chewy necklaces for boys and girls or scented necklaces that could be used to increase or decrease levels of alertness. I hope some of these ideas are useful for your teen or teens! This age group can be so tricky to work with and the key is finding strategies that are internally appealing and motivating to them. The teen has to be motivated to participate in these strategies and to have an understanding of why they are doing what they are doing. I will be following up in a few weeks with more posts regarding specific sensory systems and strategies we can use with our teens. Thank you for your patience with this newbie to blogging! Courtney Dickinson has been a pediatric OT for the past 14 years. She lives in Wilmington, NC with her wonderful husband and 2 handsome boys. She and her family have been in Wilmington for the past 6 years and absolutely love the beach life! They have recently moved so they are about a 5 minute drive to Carolina beach, with high hopes one day of actually living on the beach! Courtney’s boys are 2 and 6, so they keep her very busy, but she and her husband wouldn’t have it any other way. 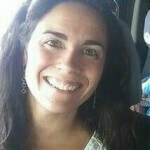 Courtney graduated from the University of Buffalo (SUNY) in 2002 with a BS in Occupational Therapy. After graduating, she worked in the school district in Rochester, NY for 2 years and also did some part-time work in a sensory clinic. In 2004 she moved to Raleigh, North Carolina where she worked in a private pediatric clinic for 6 years. She learned a lot during that time and really grew as a therapist. 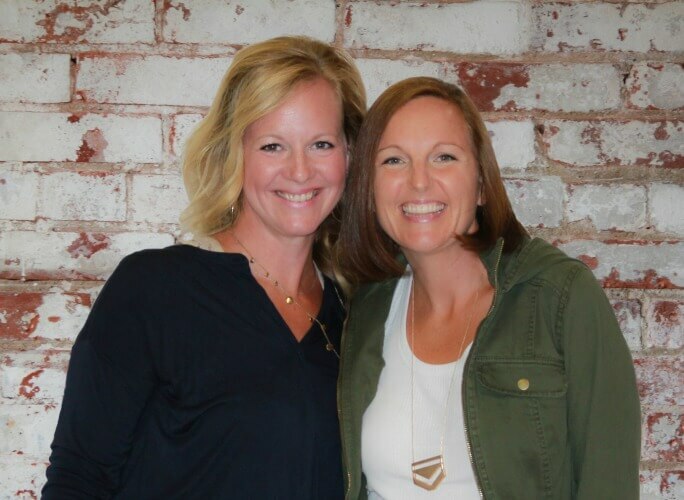 In 2010, she moved to Wilmington to be closer to the beach and has been at her current job since then, a pediatric clinic where she does a combination of clinic-based, home-based and some school-based therapy. Courtney loves the diversity of her current job. Her background is heavy in sensory integration. She has her SIPT certification and has attended many other sensory processing courses over the years. Courtney loves OT and pediatrics and feels lucky to have found such an awesome profession! I am an adult with sensory processing differences, and I am very pleased to see an increase in blogs/posts specifically addressing teens and adults. On my website (fidgetclub.com) I sell some of the products that have helped me over the years. The most helpful teen and adult fidget that I have created and used is my bike chain fidget necklace. It looks very cool and helps me concentrate during classes.